NOTE: An update to this blog post, part two, has been posted here and part three here. The EU acknowledges that there is a “pressing need” to restore security in order to “avoid the Central African Republic (CAR) sliding towards complete state failure … and large-scale massacres”. 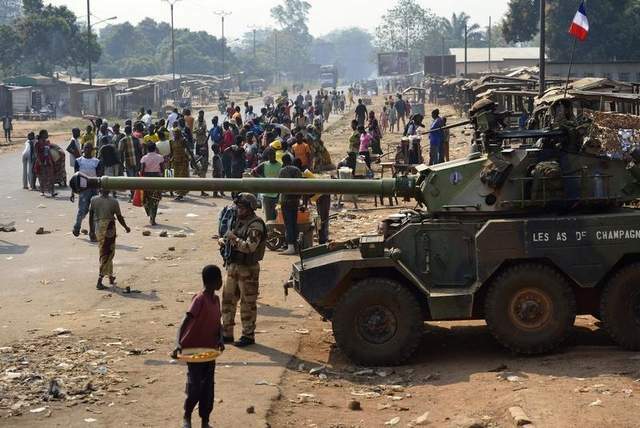 As a result, European Union foreign ministers took the first step yesterday toward deploying an EU military force to assist French and African troops trying to quell anarchy in Central African Republic. EU foreign ministers said the aim was to protect civilians and to create conditions for supplying humanitarian aid. The European Union will deploy its first major military operation in six years. More than a million people have been displaced by the violence and more than 1,000 people were killed last month alone in Bangui. Yesterday, CAR’s National Transitional Council (CNT) chose the mayor of Bangui, Catherine Samba-Panza, as the new interim president. She replaces Michel Djotodia, who stepped down on January 10 under intense international pressure after falling to halt inter-religious violence in CAR. Samba-Panza, chosen in a second-round runoff, will be tasked with overseeing the government until democratic elections can be held. The EU Humanitarian Aid Commission also announced on Monday that CAR would receive roughly 678 million euros ($500 million). “Today’s meeting put an end to the Central African Republic being an aid orphan forever,” the humanitarian aid commissioner, Kristalina Georgieva, said. What urged the EU to act? According to UN figures, nearly 1 million people have been displaced by the conflict. In the capital, Bangui, half of the population – some 350,000 people – has been displaced. An estimated 100,000 people have crowded into a camp near the airport outside of the capital city. A senior U.N. official warned of a risk of genocide there without a more decisive international response. Last month, France contributed 1,600 soldiers to a 4,000-strong African Union mission on the ground tasked with maintaining order in CAR. France had been urging its allies to provide aid since December when sectarian clashes linked to political instability in the country escalated and unleashed a humanitarian crisis. A pending UN force could number 4,800 soldiers but will take months to be formed, funded and deployed while it has been approved. The foreign ministers of the 28-nation European Union agreed on a “crisis management concept,” for a multinational European force that would help stabilising the situation in and around Bangui. The ministers approved an outline plan to send a battalion-sized (400 – 600) force to the violence-torn country but detailed military plans still need to be worked out. The EU force should be based around the capital Bangui and its airport, and EU Officials hope it will start arriving in Central African Republic by the end of February. It will stay for up to six months before handing over to an African Union (AU) force that is building up its strength on the ground. It is not yet clear which EU countries will contribute troops. Estonia has promised soldiers, and Lithuania, Slovenia, Finland, Belgium, Poland and Sweden are among countries considering sending troops. Large EU countries such as United Kingdom, Germany and Italy have said they will not send ground troops. It was the last chance for EU Battle groups. The EU battle-group would help to bring the international presence up to or above the figure of 9,000 troops that the UN’s secretary-general, Ban Ki-moon, believes may need to be deployed in the country. However, regarding CAR, nothing will come of the battle groups. Just weeks before the long-awaited EU summit on defense which took place in December 2013, European military and security experts drew up plans to finally send an EU battle group into its first ever mission. They wanted it to go into the Central African Republic to help France’s mission there. But United Kingdom reaction to a possible EU mission in the Central African Republic was so hostile that Paris officially never even raised the issue of calling in the battle group. Swedish Minister Carl Bildt said that “Sweden will engage and contribute to the operation.” But he is very disappointed not to use the “battle groups”. “We think it was pretty obvious to use the EU battle groups […] If we do not use it now, it shows that they are not useful and will never be used”. Battle groups have been on standby since 2007, rotating between different EU countries, but have never yet been deployed, leading defence experts to question their usefulness. The EU has 7,000 staff deployed around the world on 12 civilian missions and four military operations, including combating piracy off Somalia and training the Mali army. This entry was posted on 21/01/2014 by ISIS Europe in François Ducrotté, Opinions and tagged Battlegroups, CSDP, CSDP mission, Defence, EEAS, EU, EU Crisis Management, EU Foreign Policy, EU missions.